Our VegFest Houston 2011 Inaugural Year Rock Stars! Are you interested in being part of something huge and helping inspire others to live a vegan lifestyle? 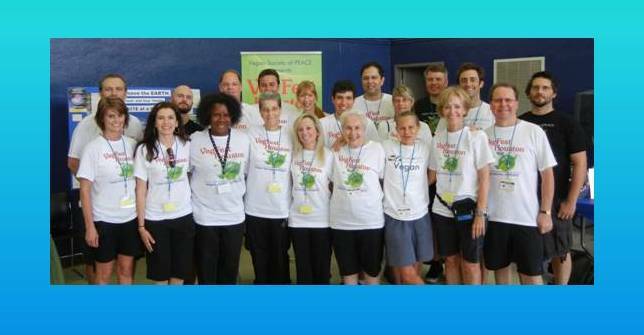 If so, we'd love to invite you to be among the many wonderful and dedicated VegFest Houston Volunteers! Friendly volunteers (ages teen and up) are needed to help in various areas on the day of the festival, plus festival clean up. In addition to the rewards of volunteering your time and enthusiasm at our annual festival, you'll also receive special rewards reserved only for our volunteers -- plus, invitation to our exclusive, private VIP VegFest Houston after-party. Please email us if you are interested in volunteering! We have 2 shifts available so you can volunteer and still enjoy the festival! *We can also approve volunteer time for National Honor Society High School Students. Sunday, April 22, 2012 at 1:00 PM. Held at Loving Hut Vegan Restaurant in Houston in conjunction with our Official Earth Day Vegan Lunch. Sunday, May 6, 2012 at 3:00 PM. Held at a private residence in League City in conjunction with our Vegan Tea Social. Saturday, May 12, 2012 at 7:30 PM. Held at The Havens Center in conjunction with our monthly VSOP "2nd Saturdays" Potluck Meetings. Saturday, May 26, 2012 at 6:30 PM. Held at a private residence in the Heights, directly after our Vegan Society of PEACE Bake Sale Fundraiser.